The newest ship in the Holland America Line will have an old name. Due for delivery in May 2021, the next Pinnacle Class ship will be called – drum roll, please – Ryndam. 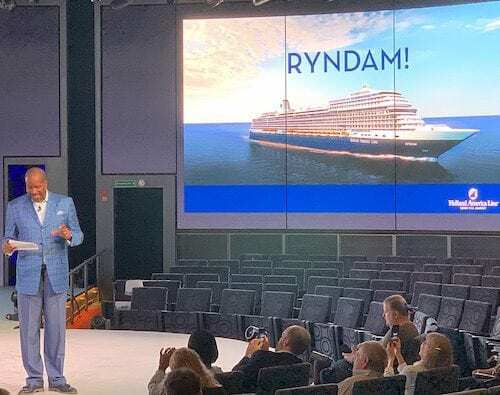 Holland America Line’s president Orlando Ashford announced the name at a media luncheon aboard Nieuw Statendam before the official start of Seatrade 2019 in Miami. It will be the fourth ship in the company’s history to carry the Ryndam name. 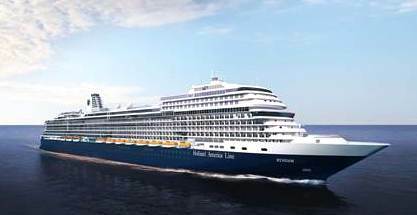 “Holland America Line honors the timeless tradition of cruising while also embracing new innovations for today’s travelers, and the name Ryndam reflects the unique history of this company while honoring previous ships that were progressive in their time as this last Ryndam will be,” Ashford said. The steel cutting for Ryndam, signifying the official beginning of the building process, was held March 13, 2019, at Fincantieri’s shipyard in Marghera, Italy. The first Ryndam was part of the Holland America Line fleet from 1901 to 1929, starting as Rijndam before receiving the English spelling in 1923. In 1927 Ryndam I became the first Holland America Line ship to sail a world cruise, although it was chartered as a floating school at sea for that voyage. “I’m really proud of what we’re doing,” Ashford said. He added that he also is proud that he was able to convert a non-cruiser into a cruise lover – his own father. Imagine, Ashford said, being president of a cruise company and having a father who would not cruise. “Dad said, ‘I haven’t been on a boat since the military and I’m not going to do it now,’” Ashford said. However, Ashford said his father really wanted to visit Cuba so Ashford offered him a Cuban visit on a Holland America cruise. “Dad is a man of very few words,” Ashford said. But one night on the cruise, “my Dad leaned over and said, ‘Son, I could do this again … He is going to Alaska on a cruise this summer.